Clarke County Hospital is a 25 bed facility providing a warm and comfortable environment for patients and families. Professional caregivers provide care for adolescents, adults and hospice patients. The unit provides patients with individual patient rooms, including a private bathroom, designed with your comfort in mind. Acute nursing staff provides medical-surgical and pediatric nursing care to those who are in need of daily physician and registered nurse care. Our nurses are certified in Advanced Cardiac Life Support and Pediatric Advanced Life Support. Skilled care is provided to patients who require additional hospitalization after receiving treatment or a surgical procedure. Eligibility requires a 3-day inpatient overnight stay in the hospital and physician certification. A skilled level of care means that your condition has improved, but you are not ready to return home. The care may include IV therapy, rehab services and wound therapy. Skilled care provides patients the opportunity to safely transition from the hospital back to their home environment. 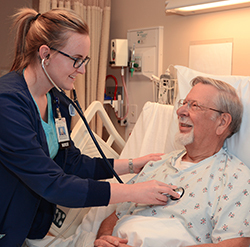 Extended Care is available to patients who may not be able to return back home or previous living environment and need more nursing assistance. Patients pay privately for the services which include room and board, meals, laundry and cable TV. Extended Swing patients will have the opportunity to participate in daily activities and other special events. Patients will experience individualized care in a warm environment. Clarke County Hospital contracts with local hospice agencies to provide care to patients at the end of life. The acute nursing staff works in partnership with your chosen hospice provider to provide physical, emotional and spiritual care for patients and families. A comfortable, private hospice room is available on the unit, to provide more space for patients and families to be together.